Half a year ago, a good friend informed me that she's moving to Muscat and upon hearing the awesome news, Ed and I decided to pay her a visit once she is settled. 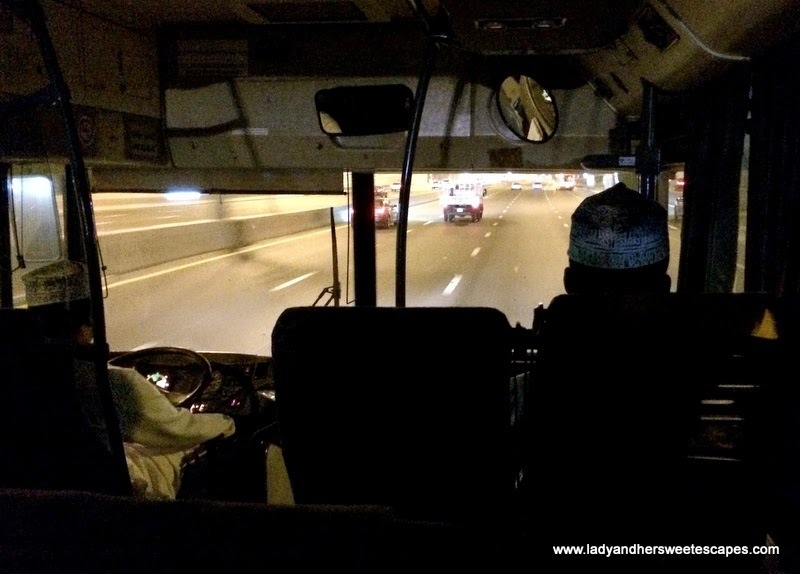 After handling some conflicts in our work schedule and Ed's passport renewal, we finally made our way to Oman on board the ONTC bus last week. Two days before our trip, my husband gave Oman National Transport Co. branch in Dubai a call and asked for the bus timings and fees. He was informed that there are three trips to Muscat daily; 7 am, 3 pm and 11 pm. The night bus was perfect for me who must be at work until 9 pm on the day of our travel. Twelve hours before traveling to Muscat, we purchased our tickets at Oman National Transport Co. bus terminal behind DNATA and Ponderosa Restaurant in Deira. The personnel had to make sure that we have valid Passports and UAE Residence Visas, hence he asked us to call Oman's immigration office. 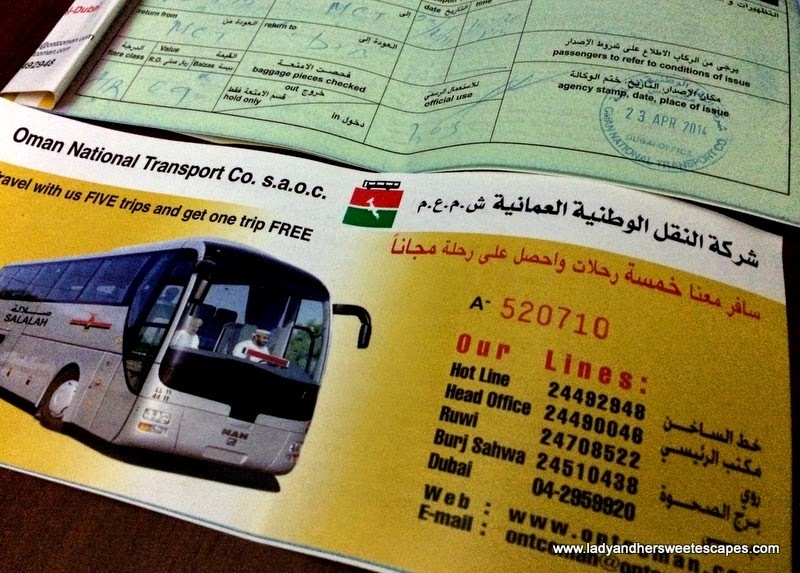 When everything was clear, we paid 90 AED each for our Dubai-Muscat round trip bus fare. He left the return trip open so we can schedule our travel back to Dubai anytime we want. As I had to travel straight from work, I had my dinner while on the road. Eating and drinking are not prohibited on board the ONTC bus; great for me who loves to munch! There are no toilets in the bus though, so I really had to limit my water intake. Lights were off as soon as the bus started to run. Right after eating, I began to kill zombies on my phone while Ed grabbed some snooze. At midnight, we reached the UAE-Oman border and encountered series of check points before we arrived at Dubai Immigration for our exit stamp. We were back on the road when everyone had their passports stamped, but after 15 minutes, we had to disembark once again with all our bags for luggage check. After the thorough checking of bags, we boarded the bus and reached the Oman Immigration at 1 am. We went off the bus with our passports, filled out a Visa form and paid the fee. For UAE residents, Oman Visa costs 50 AED or 5 RO. We had the option to pay in UAE Dirham or in Omani Rial. After the Oman Visa stamping, we were back on the road. All the while, I thought we still had to travel for four hours more as Dubai-Muscat trip usually takes six to seven hours. I was surprised when I saw a signage that we were already in Muscat at 3:30 am! ... and off we went to Muscat! We arrived at ONTC bus terminal in Ruwi before 4:00 am. We were two hours earlier than expected, most probably because the bus was half empty and Visa stamping was a breeze for all passengers. At the terminal, there are taxis ready to take passengers to their destinations. The area is well-lighted and look really safe. We sat in one of the benches in front ONTC office as a friend of my friend promised to fetch us. We wouldn't mind waiting until sunrise, yet he immediately made his way to Ruwi bus terminal as soon as he learned that we have arrived. After three days of exploring the wonders of Muscat and the neighboring towns, we traveled back to Dubai on a newer and nicer ONTC bus. We left Ruwi bus terminal at 3 pm and arrived at ONTC in Deira at 10 pm. The trip took 7 hours as the bus was almost full and had to pick up passengers at ONTC terminals along the way. Entry stamping for all passengers at Dubai Immigration took an hour and a half as tourists had to go through eye scan as well. The place has been part of my family for awhile, with my husband having worked there for a some months, and he would travel weekly back to Dubai by road or air, and had made Filipino friends on those bus or air trips. Oh, thank you! :) I'm glad this blog post helps. Next january 2016 I'm going to make your same bus trip from Dubai, except I will return to Abu Dhabi via plane. thank you very much for your post.. Cool! How was the hike?